Before the launch of Reliance Jio, Bharti Airtel was the choice for most of the telecom service users. But one day, Reliance Jio started offering unlimited true 4G data, and everything changed. But as Airtel still has huge funds to offer same benefits like Reliance Jio, it recently launched Airtel Rs 49 and Rs 92 add-on plan for its prepaid users. So, now users can recharge with these Airtel add-on plans to get more data. In this article, we will be talking about Rs 49/ 92 add-on plan details and how you can recharge with them. So, without any further do, let’s get started with the all new Airtel add-on plans. 1.1 How To Get Airtel Add-On Plans Recharge? Well, the Rs 49 add-on plan offers 3GB of high-speed data and the Rs 92 add-on plan gives 6GB of 4G data to the customers. Currently, these plans are available only for selected prepaid orders. But the twist comes on the validity period of these two new Airtel add-on plans. If the user recharges with any of these add-on plans during using any unlimited combo plan, the validity of these plans will be same as the combo plan’s validity. But if the users have not subscribed to any plan already, three days validity will be provided with the Rs 49 add-on plan and Rs 92 add-on plan will be valid for seven days only. In contrast, Reliance Jio is also providing the same kind of add-on plans. In case any unlimited plan users get out of the daily FUP limit, they can easily initiate an add-on plan recharge for additional data needed. Currently, Reliance Jio is providing Rs 11, Rs 21, Rs 51 and Rs 101 add-on plans. And these two new Airtel add-on plans Rs 49 and Rs 92 will be competing with Jio’s Rs 51 and Rs 101 addon plans. Both of these Jio plans offer same benefits but Airtel is providing a slightly lower pricing which might be a plus point of Bharti Airtel in front of subscriber’s eyes. How To Get Airtel Add-On Plans Recharge? 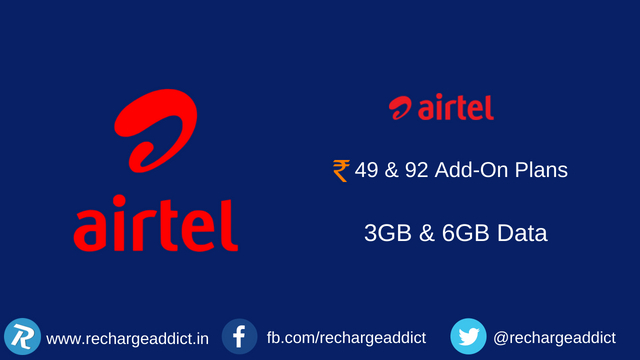 It is very simple to recharge with Airtel Rs 49 or Rs 92 addon plans. But I recommend you to firstly call on Airtel customer care number 198 and ask if it’s available for you or not. Once they confirm, you can either use My Airtel app to recharge or use any digital payment service such as Paytm, Mobikwik or FreeCharge. Users may also visit their nearest retail store to get any of these addon plans recharges.